The below process was agreed to by consensus at the meeting on 2009-11-17. NOM_DATE: 2009-12-01. Date nominations close. NOMINATIONS ARE CLOSED. ELECTION_DATE: 2009-12-08. Date on which the elections are held. Ballot collection will close at 9PM on this date. Absentee ballots must be received by this date. VOTE_COUNTER: Person who processes the votes. Seth Schoen, the Secretary, will do this with the assistance of at least one other person TBD. This is what it should look like filled out correctly. Don't use check marks! Use numbers! Nominations shall open immediately, and close on 2009-12-01. Nominees shall be listed on this wiki, on 2009 Board Nominees. On 2009-12-01 the wiki page will be locked for changes, so if you want or don't want to be a board member, make sure your name is or is not on it by 2009-12-01. "Write a ranking next to one or more candidates (i.e. 1 is most preferred and larger numbers are less preferred). You may repeat your rankings as often as you want or leave any number of candidates unranked, but we suggest you rank at least 4 candidates as there are 4 openings." The Secretary will provide a list of all members in good standing (these are the eligible voters) by 2009-12-01. If you aren't sure you're in good standing, check with the Secretary (Seth Schoen) or Treasurer (Jeffrey Malone) before then. Good standing basically means you're paid up. This list will be the voter roll. It will be available for review by any member upon request from any board member or officer. We will have a ballot box at Noisebridge from 2009-12-01 onwards into which you may place an absentee ballot if you can't make it to the election. If you can't make it to Noisebridge at all you can mail a ballot, which must be clearly marked 'BALLOT' on the envelope, to the PMB address which we'll check the afternoon of 2009-12-08. You can also submit your ballot to any board member or officer, or in any other way it occurs to you as long as it gets into the box by 2009-12-08. On 2009-12-08 all those on the voter roll who have not already voted will receive paper ballots and can fill them out and put them in the box. After every member who chooses to vote has put their ballot in the box, Seth will set up the Python Schultze implementation written by Ka-Ping Yee (http://zesty.ca/condorcet.zip) and enter all the votes into it. The 4 nominees with the most wins will become the new board members. We will do no work to prevent voting fraud (fraud is after all un-excellent). If there are many more ballots than voters on the roll, we'll have to throw out the results and do something else. If there are only one or two more ballots than voters, we will assume that someone voted twice by accident, forgetting that they already did, and accept the results. "I do not believe we currently have any active members identified solely by digital signature. (What a shame!) However we do have one anonymous member AFAIK, who may wish to become so identified for voting purposes. If we want to support electronic voting we can publish a GPG key to which signed ballots can be encrypted. However I have no reasonable way to implement secret ballots in such a system." If someone wants to support electronic voting they should build a system and demonstrate its use. Rachel, Andy, Miloh, and Ani were elected as directors of Noisebridge. One ballot was a spoof containing a vote for Richard Nixon. One ballot was a piece of paper with just the name "Ani" written large in crayon. 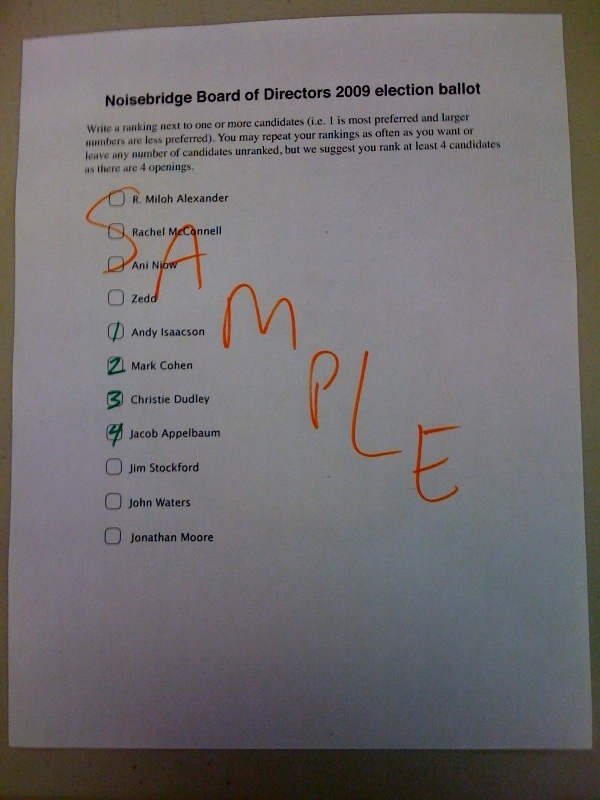 One ballot had some candidates ranked with integers, some with e and pi, one with sqrt(-1), and one with infinity. The counters felt that if sqrt(-1) had not been present then the voter's intent would have been obvious, but given incommensurate cartesian values it was a spoiled ballot. Several ballots had crossed-out values, difficult-to-read integers, and other confusion, but were easy to agree on an interpretation. One ballot had checkmarks rather than integers, and was treated as a "1" vote for each check and a - for each blank. The following data is formatted for use with Ping's condorcet implementation. This page was last edited on 18 November 2017, at 00:31.